DUTCH VERSION IN REPLY WITH MORE NEWS!!! The MixMeister Control is a MixMeister-focused MIDI controller from Numark designed to make working with MixMeister easier, more fun and to some extent flashier for live use. Most of its features are reasonably specific to using the Fusion version of the software in live mode, but it makes working in offline mode considerably smoother too. 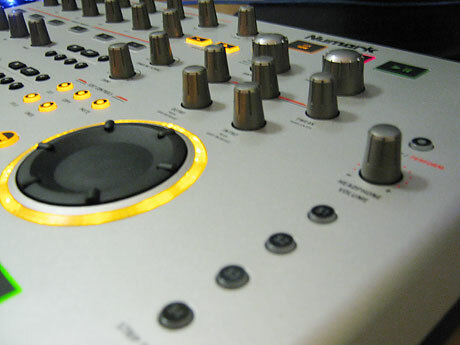 The Control is a very direct translation of the MixMeister interface to a controller. 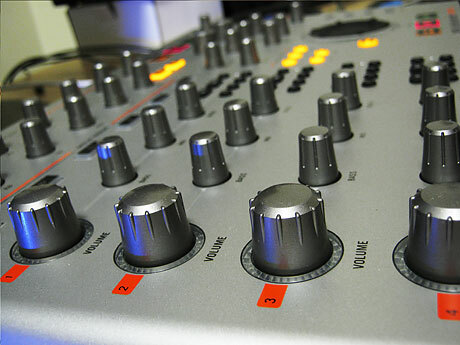 The left part of the controller has four rows of knobs controlling the volume, bass mids and treble for four timeline tracks, as well as a series of buttons for loop and cue control. Top-left is a bank of twelve clickless infinite-turn dials for assigning to VST effects. The right of the controller contains the tracking dial, transport controls, edit controls utility controls. There are also strip solo buttons and timeline zoom/scrolling knobs, all of which are very useful and keep your hand off the mouse. Above these are five dials controlling the position of the intro and outro markers of the two tracks in closest proximity to the playing monitor marker, and track and tweak selection dials to control the automatic selections of the current track. All of these dials are clickable, with a good solid thunk behind them, and allow you to change the grid density with the intro/outro dials, and push-to-select for the track/transition/tweak dials. Above this again are two larger knobs labeled ‘browse’ and ‘preview’. The browse knob scrolls up and down through the library, and pushing it adds the currently highlighted track to the set. This works well, but won’t get through a large library easily – it really needs to be used in tandem with a keyboard and the search feature. Once isolated by BPM or a couple of search terms though, it’s a more tactile interface for looking for a track than a mouse. The preview knob is extremely useful. By pressing it, the currently highlighted track begins to play as a preview, and adjusting the dial moves the preview forward and backwards through the track, eliminating the issues with clicking the very narrow band under normal use. A second push stops the previewing track. The layout is largely very easy to use. For the right-handed among us, the jog dial and transport controls are directly underneath the natural position for your hand, volume and EQ dials have a sensible layout and the effects are accessible by either hand. The only difficulties with the layout are the preview and browse dials. These are so constantly accessed that their position squeezed up with the slimmer track/transition/tweak dials just doesn’t work very well. There’s not quite enough room for the thumb in between the browse and track dials except at a steep angle, especially when scanning quickly. The final set of buttons worth noting are those for use in live performance. To the top right of the jog dial, above the headphone volume knob, is a button labeled ‘preview / perform’. This only works during live mode, and is more or less a PFL/master button. The major issue with it is that there is no feedback as to which mode your headphones are in; as it’s a button not the usual toggle-switch or mix dial, picking which mode your headphones are in can sometimes require a bit of a listen and pound on the transport play/pause. The jog dial Numark has used for the MixMeister Control is nicely weighted to use and allows you to quickly scan through the set. It’s loose enough to spin freely with and stop with a tap, making seeking quick and easy. The orange backlighting is a little bit unfortunate, but the ring serves to show precisely where the jogwheel is in even a pitch black room. Those who have used a Numark CDX or HDX will be familiar with this jogwheel – it’s the same part as used on those players. The play/pause and stop buttons have a nice clicky feel to them, similar to a mouse. The ‘Mix Now’ button is of course identical, though of lesser utility. The orange rings of light around the four volume dials light up as the monitor marker passes over any particular track. So if there’s a track on the top and bottom rows of the timeline under the marker, the top and bottom volume dials will be lit and active, and their respective EQ and sequencer banks will become active. When the live mode is in use, the EQ and volume dials control underneath the live marker, and not the monitor marker. This allows you to ‘mix live’ in some sense. The transition is set up, but you still have to run the balances and EQ live, which can be a bit more of a show. In fact, tweaking anything live wipes any levels for the rest of that track, so it’s really an either/or: use the built in and planned transitions or use the controller knobs. The EQ works acceptably, but isn’t great. It’s incredibly twitchy at the high end of volume, at least on the display – it never sounds jumpy. The only beef with the EQ and volume dials is that they’re infinite dials. Anyone used to a studio mixer is already confused. The idea is that you watch the timeline while adjusting settings. It works, but the lack of that ‘where are my settings’ feeling on the mixer itself is pretty difficult to get used to. Given the way that MixMeister actually works, it’s impossible to use absolute dials – but this shows one drawback of live performance on a timeline. Still, anyone used to Ableton is used to this kind of limitation. The MixMeister Control is a quite well put together piece of equipment. The dials and buttons are all firmly attached to the chassis, the buttons feel solid enough to stand up under pressure, and the USB port - a major failure point in MIDI controllers - seems to be better than usual. It’s difficult to tell without cracking the case but it looks like a chassis-mount connector rather than a PCB-mount connector, a very good sign for its long-term durability. That said, in a controller at this price point, something had to give, and in this case it seems to be the surface finish. 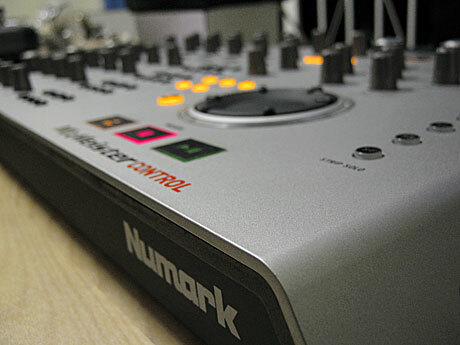 The knobs and surface are covered in a uniform silvered paint over a thermoplastic, which is cool – but it’s going to go better with a Numark TT1625 than a TTX-USB. The paint is good quality, well mixed and provides a smooth finish, but will definitely not stand up to any serious wear and tear and will begin to chip and fade unless care is taken when moving the device – a backpack thrower this is not. The electronic quality is probably reasonably robust. MIDI technology has been out and about for a good thirty years and the microcontroller for a panel such as this fits in an area the size of your thumbnail and costs twenty cents. All of the button and dial lights are LEDs, so won’t be dying any time soon. Barring liquid damage, the first thing to fail in this device would likely be the tracks under the dials. A year or two’s regular use and gigging shouldn’t be out of the question, but the device doesn’t strike out with that bomb-shelter build quality found in more expensive controllers. 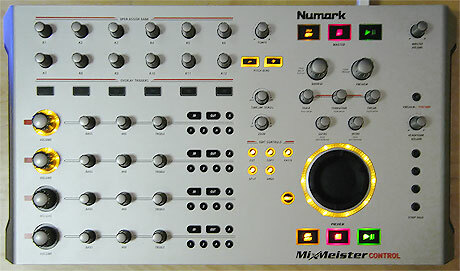 The MixMeister Control originally shipped with Fusion. Now, however, it ships with a version you won’t find on MixMeister’s website, “Fusion Live”. This is basically the same thing as Fusion, but with no included VST effects, no support for webcasting, and crucially, no ability to export mixes to WAV or MP3. The lack of VST effects is no major issue since the VST engine is still there (so you can add your own effects), and webcasting support is to taste, but the removal of mix exporting makes use of the Control package to produce mixtapes impractical at best. This does mean that the Control package is not a good choice unless you solely want to use it (and the MixMeister it comes with) for live performance. The price of MixMeister was not well addressed in the main review, but becomes important when considering whether the Control is a worthy purchase. MixMeister Studio, the mixtape edition of the program, costs U$200 direct from MixMeister. Fusion, the premium live performance edition, costs $330. The Control package, with its ‘Fusion Live’ edition of MixMeister weighs in at $300. There is also an upgrade to the full version of Fusion available from MixMeister, which costs $199, bringing the total cost of ownership to $530. Mixmeister has indicated that existing users of Studio and Fusion can get an upgrade discount to the MixMeister Control by phoning their sales department direct. The Control is a MIDI device with some flaws. It’s not the highest quality device out there and it probably won’t last forever, but Numark has brought their true form: more features included than you can shake a stick at, and at a low cost. It’s genuinely difficult to think of anything they’ve left out – the board is packed with knobs and buttons, and they all do something useful. 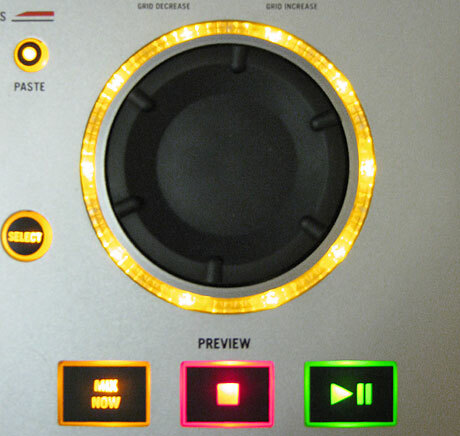 The software integration is solid, the device allows Fusion’s (and the included Fusion Live’s) performance mode to come into its own, and the transport, solo and preview controls are very convenient even when using MixMeister in its offline production mode, should you choose to pay for the Fusion upgrade. The Control package is a good deal for working DJs using it as a central performance tool at the normal street price, but a bit expensive for a bedroom DJ wanting to try something different to a more conventional controller. The lack of record functionality also prevents (easy) use of the included MixMeister version for crafting demos and mix CDs, so it’s difficult to recommend unless live performance is the only task required. MixMeister Studio still comes with high praise for creating mixtapes, demos and just learning mix theory at home. Day-to-day DJs may want to give the Control a look as an alternative to decks-and-a-mixer setups for gigs, because MixMeister is a very, very nice piece of software indeed. MixMeister Fusion Live software gives you a radically different approach to DJing, so you can focus on rocking the party – not the nuts and bolts of DJ technique. You don’t need to concern yourself with counting and matching beats, setting cue points, or syncing keys. MixMeister does all the technical work for you, freeing you to be in total creative control to interact with your music – and your audience! Merging powerful Digital Audio Workstation capabilities and full-featured DJ performance, MixMeister Fusion Live is one slick package. 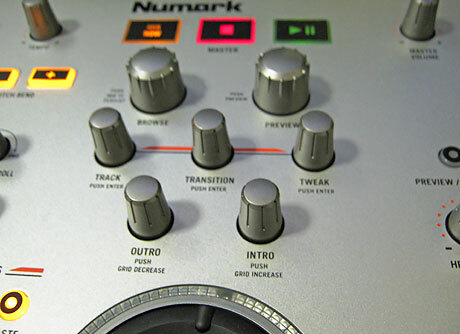 At Numark, we love software, but we also know that DJing with software on a computer has one big weakness – NO KNOBS! Enter MixMeister Control: the only hardware control surface specifically designed for interaction with and control of MixMeister. All hail the return of the knob... 40 of them, along with 53 buttons, and a big honkin’ jog wheel. Who said DJing with software had to feel like checking your email? MixMeister Control is designed to work like a hardware extension of MixMeister software. MixMeister Fusion Live eschews everything you know about traditional DJ software and workflow. Forget the turntables-and-a-mixer thought-process and remember the best gig you ever played. What makes a great show great is the production value of the performance; not the technical aspects. Fusion frees you from worrying about counting and matching beats, setting cue points and worrying about the key of each track, enabling you to spend your sets wowing the crowd, not squinting at little masking tape strips. MixMeister Fusion Live helps you mix complete sets from full-length songs. You get the functionality of a loop editor and Digital Audio Workstation, and you can blend songs together to create masterful music mixes. You can manipulate tempo, volume, and EQ in real time, on-the-fly. MixMeister Fusion Live records all your DJ actions, not just audio, so you can go back after the show, and edit studio-style. Whether you use MixMeister to rock the party, make your own mixes... or both, MixMeister Control is the only serious way to interact with your music. MixMeister Fusion version 7.4.4.5 is now available. This new version contains a number of enhancements for customers working with MixMeister Control. We recommend all MixMeister Control users install this new version for improved functionality and stability. Clicking this link will take you to MixMeister.com for your download. Numark's MixMeister Fusion is een krachtig mix en sequence programma welke de DJ het vermogen geeft om zijn mixen op een heel andere manier te benaderen dan bij het traditionele mixen. Numark's MixMeister Fusion stelt de DJ in staat om een mix kompleet aan te passen in een werkomgeving zoals een digitaal audio workstation. Deze innovatieve benadering maakt het mogelijk om een full length mix te construeren en te produceren op je beeldscherm. Door het automatiseren van de beat match taken, kun je tot wel acht sporen tegelijk laten lopen zonder er naar om te kijken, zodat je alle tijd hebt om allerlei coole features aan je remix toe te voegen zoals intelligent looping(tot 8 volle maten) het toevoegen van extra samples in de maat en de mogelijkheid om vele effecten aan je song toe te voegen. De software neemt alle DJ akties en veranderingen op, en deze kunnen achteraf nog weer worden aangepast zodat je de perfecte mix kunt maken. Daarnaast voegt Numark’s Mixmeister Fusion de spontaniteit en actie van het live mixen toe door het ondersteunen van meerdere audio uitgangen en voorafluistering van koptelefoon en monitor. Ook beschikt hij over een super stabiele perform mode voor gewoon afspelen van je tracks, een draadloze afstandsbediening en is er de mogelijkheid om ook met andere externe apparaten zoals een draaitafel of CD speler te beatmixen. Numark's MixMeister Fusion geeft veel uitbreidingsmogelijkheden door dat het met een zeer groot aantal MIDI hardware controllers te verbinden is. Als de mix klaar is kan deze als MP3 worden geexporteerd of direct op een cd worden gebrand met de geintegreerde brand software. Nieuw in de Numark stal is de MixMeister Control, deze hardware controller stelt je in staat om realtime je MixMeister software te controleren, maar kan ook worden ingezet voor andere Midi software. Als je de MixMeister software al gebruikt, kun je echt in enkele minuten een professionele mix maken. De MixMeister Control wordt geleverd met een volledige versie van Mixmeister Fusion. MixMeister software heeft Dj'ing een nieuwe dimensie gegeven door de kracht van volledig Digitale Audio Workstation functies samen te laten smelten met hands on live dj control. MixMeister Control is een hardware controller voor MixMeister Fusion en andere MIDI aan te sturen software. Met deze controller worden de mogelijkheden voor real-time performance nog intuïtiever en gemakkelijker. MixMeister Control is de enige controller speciaal ontworpen om optimaal te fungeren met MixMeister Fusion. De controller werkt als een volwaardig verlengstuk van de software interface. Als U al gebruik maakt van MixMeister zult U in enkele minuten kunnen lezen en schrijven met de MixMeister Control. De MixMeister Control wordt geleverd met het volledige MixMeister Fusion pakket. De MixMeister Control beschikt over 40 rotary controls en 53 druk knoppen, welke al geconfigureerd zijn voor direct gebruik met de MixMeister software. Dit groot aantal knoppen biedt de mogelijkheid om MixMeister grotendeels aan te kunnen sturen met minimale interactie van de muis of het toetsenbord. Zo zijn functies als Looping per track, EQ, FX en Browser functies volledig te bedienen met de Controller. De meegeleverde MixMeister Fusion software geeft de Dj de vrijheid om meer bezig te zijn met het creatieve gedeelte van zijn performance zoals live looping, harmonisch mixen en remixen, dan het eigenlijk technische deel zoals CUE punten aanmaken en beatmatchen. Alle bewerkingen met MixMeister zijn non destructive. Dit betekent dat U uw live mix kunt opnemen, later terug luisteren en achteraf alsnog kunt bewerken met de precisie en editing mogelijkheden van een opname studio. Of u MixMeister nu live gebruikt of alleen als studio toepassing, de MixMeister Control is een "must-have" aanvulling op elke Dj setup! Op deze pagina: http://www.tonecontrol.nl/nl/producten/ ... r-control/ rechtsonder in YouTube filmje zit overzicht van nog meer filmpjes met veel mixmeister opties, voor producing, gezongen tekst aanpassen etc. MixMeister Controler Filmpjes: +optie full screen weergave! Ongeveer een jaar geleden namen we de software van Mixmeister Studio en Fusion onder de loep, vandaag is het de beurt aan de Mixmeister control, een hardware controller. Vele beatmixing dj’s zaten hier al sinds de beurzen in LA en Frankfurt op te wachten en na enkele haperingen is het er dan toch van gekomen. Ik moet wel toegeven dat ik persoonlijk er nogal sceptisch tegenover sta, omdat ik het concept van Mixmeister in een live dj-set niet echt zie zitten. Maar, vooroordelen zijn er om weerlegd te worden, dus laat ons een kijken wat deze controller kan doen om me te overtuigen. Architectuur Deze controller is vet en futuristisch. Met zijn matgrijze kleur en iets donkerdere draaiknoppen, afgewisseld met geel oplichtende toetsen of kanalen, het zwarte, klein wiel en de kleine, zwarte looptoetsen. Er is heel veel plaats tussen alle toetsen en draaiknoppen voor een optimale bediening. De controller is vervaardigd uit hard krasvrij kunststof en echt een lichtgewicht (ongeveer 2kg), wat hem naar mijn aanvoelen een iets minder professioneel trekje meegeeft. Hij meet 440/490 x 262 x 65 mm, de lengte varieert want bovendaan helt hij lichtjes af. Deze controller heeft niet veel aansluitingen nodig. Eén USB-aansluiting die, aangesloten aan een mac of pc, deze controller ook van stroom voorziet en een stroomadapteringang van 6V/1A. De adapter is optioneel verkrijgbaar voor het geval je de controller wil inzetten voor als MIDI-controller voor andere MIDI-aanstuurbare softwaretoepassingen. Als extraatje vind ik in de doos de complete Mixmeister Fusion, gratis en voor niets. Denk er wel aan dat je eerst je controller dient aan te sluiten vooraleer je de software installeert. Dit is al de tweede keer dat ik zoiets moois mag ontvangen als een handleiding van een Numark-toestel! Een mooi boekje in A5-formaat met een glanzende kaft in zwart/wit met hierin een snelstart handleiding in 5 talen: Engels, Spaans, Frans, Italiaans en het Duits. Via de website http://www.numark.nL kan je ook de Nederlandse versie downloaden. In deze handleiding wordt kort de functies via woord en beeld uitgelegd, alsook de software toegelicht en dan meer bepaald wat je op je scherm te zien krijgt. Interessant is ook de MIDI-mapping waar je kan zien welke knoppen en toetsen het MIDI-protocol ondersteunen. Specificaties, mogelijkheden & Ergonomie De controller is zeer gemakkelijk te installeren met de USB plug ‘n play interface (geen driver nodig, 1.1 compatibel). De software van Mixmeister Fusion was er ook weer in een wip op zodat ik binnen de 10 min. al aan de slag kon. Maar, nog steeds weet ik niet waar ik deze controller tijdens mijn live gig kan inzetten, maar dat zal nog wel komen, ik ben af en toe wat aan de trage kant. Zoals eerder gezegd dus ben ik zelf ook verzot op beatmixen en dus was ik er een jaartje geleden dan ook als de kippen bij om de Mixmeister software te testen. Ik vond de twee paketten echt heel tof om thuis in alle rust te gebruiken om mooi afgewerkte mixen mee te maken, producestyle dus. Nu met deze controller heb je misschien wel wat meer creativiteit over omdat je niet echt meer met de muis en het toetsenbord moet werken, maar waar zet ik deze controller nu het best en wat als ik reeds met een softwarepakket mijn songs verdeel en afspeel? Je zou als het ware met deze controller alleen op pad kunnen gaan, omdat je hier de mogelijkheid hebt om je mix in preview af te spelen, naar je hoofdtelefoon of onmiddellijk live op de master. Let er wel op dat de de controller voor Mixmeister enkel geconfigureerd is voor single output, dus je moet nog even de digital output configureren zodat je beide, zowel de master als de preview start kunt gebruiken. Je zal merken dat je in deze configuratie beide samen doorgespeeld krijgt, je zal dus een dubbele of multikanaals geluidskaart configuratie moeten gebruiken om de twee lijnen van elkaar te scheiden om zo optimaal te kunnen werken. Je kan dus tegelijkertijd je master uitsturen en toch ook via preview je volgende mix beluisteren of er dingen aan toevoegen. Het begint me al te dagen waar en waarom ook ik dit kan gebruiken. Verder is de interface van Mixmeister Fusion bijna identiek aan die van de controller. Je kan ook goed volgen welke song waar op de tijdlijn aan het spelen is, ook op de controller, want daar brandt echt letterlijk de lamp, in preview niet, enkel in solo output configuratie wel. Jammer, want dit had bijvoorbeeld met een ander kleurtje gekund en dan was het nog duidelijker geweest waar je mee bezig bent of wat je waar beluistert. De overlays die je nog per muis moet voorzien van effecten, acapella’s of samples worden ondergebracht onder de zes trigger overlay toetsen die oplichten wanneer er iets onderligt dat je kan gebruiken in je mix. Loopen gaat makkelijker dan met de muis, gewoon even de toetsen indrukken, bepalen naar de lengte van de loop onderaan en als je terug uit je loop wil, gewoon op de X-toets drukken. Volume toevoegen aan je track of de toonhoogtes bewerken gaat via elk van de vier kanalen met de volumeregelaar met licht, wanneer in gebruik, en de drietraps-equalizer. Je kan alles mooi volgen op het scherm waar in de tijdlijn donker- en lichtblauwe, rode of gele bollen zichtbaar worden die een vette streep trekken, gelijk aan de instellingen die je hebt doorgevoerd voor dat stuk of voor heel de track. Nog een pluspunt op deze controller is de mastervolumeregelaar en de bpm-regelaar waar je onmiddellijk je track mee kan versnellen of vertragen indien nodig. Het wiel vind ik maar niets, het voelt nogal plasticachtig aan en biedt weinig grip. Gelukkig is het dan ook niet bedoeld om te scratchen maar enkel om stukken te zoeken die je wil bewerken, uitknippen, deleten, plakken enz., wel samen met de select-toets en de edit-toetsjes te gebruiken. Sowieso vind ik dat het wiel soms nogal grote sprongen maakt, en het zo dus niet nauwkeurig genoeg werkt. Het opzoeken van tracks gebeurt nog via het keyboard. Het doorzoeken van de library kan je met de grote draaiknoppen. Opzoeken van tracks in de playlist gaat dan weer met een kleinere draaiknop daaronder. Wil je de tijdlijn van een track eindeloos uitrekken of vervormen tot één lijn, dat gaat ook via een draaiknop en wil je op zoek gaan in de tijdlijnen van alle tracks naar een goede plaats of song, dan heb je ook hier een draaiknop. De 12 assign-draaiknoppen van 360° kan je zelf van eender welke parameter voorzien, effectparameters e.d.. Dit is dus ook ideaal om andere MIDI aan te sturen en software te controleren. Kortom, ik heb me eigenlijk reuze geamuseerd met deze controller,waar je, wil je tot in de puntjes werken, toch nog een toetsenbord en muis bij de hand moet hebben. Je kan deze echt wel live gebruiken, maar dan enkel als controller of je moet bijvoorbeeld met z’n tweeën zijn of heel veel tijd hebben om hiermee te experimenteren tijdens je gig, kwestie van gewoonte natuurlijk. Eén ding is wel zeker, je moet als mixing dj niet meer nadenken, je beatmix is perfect, nu kan je je concentreren om nog wat creatiever te mixen. Klankkwaliteit Perfecte digitale klankkleur tussen de 24 bit en 32 bit. Wel oppassen bij de bediening van de volumes van elk kanaal en de master want je bent zeer vlug aan het oversturen. Alle tracks worden gelijkgetrokken op één en dezelfde geluidssterkte. Prijs/kwaliteit is dit top. Deze controller heb je reeds voor 482,79 euro (bruto adviesprijs, inclusief btw) en vergeet niet dat voor deze prijs de Mixmeister Fusion inbegrepen is. Als live dj kan je dankzij Mixmeister en nu ook met zijn controller meer tijd besteden aan de creatieve mix dan enkel en alleen maar aan het beatmixen en dit door een minimale interactie van de muis of toetsenbord. Ik noem dit live producen en editen. Er zijn wat weerstanden van doorgewinterde DJ's, die bakken geld hebben uitgegeven aan dure Pioneers, of dat het uitmaakt of je DJ bent of niet. Ik roep daarin tegen altijd, het is de ervaring wat de DJ maakt en juist niet de equipment. Ik was een vinyl DJ pursang die argwanend keek naar CDJ players.. goed de jogwheel verving het vinyl, maar al die knopjes extra + op de mixer, dat ging mij te ver. Vasthoudend aan mijn vinyl zorde wel dat ik mijn gigs kwijtraakte omdat de clubs gewoon hun versleten technics inruilde voor frisse Pioneer CDJ's. Ik was dus een late CDJ player, wilde niet meteen al mijn geld in CDJ's steken (heb het gewoon niet als WAO-er) dus 1 nieuwe en 1 gebruikte Stanton c.303. Heb ze nog steeds, maar gebruik ze steeds minder, gezien de meters stof die elke dag er weer bijgroeit. Die Stanton heeft zo'n beetje zelfde formaat jogwheel als de vette pioneers maar simpel als de 200 type. Mixen puur als het hoort was mijn eigen-wijze oordeel. Nu ben ik ook aardig thuis in computers en een bevriende Engelse DJ gaf mij een gekraakte MixMeister versie door, van.. probeer het eens uit. Nu stond ik daar niet echt op te trappelen omdat ik al een Ableton-trauma had opgelopen, snapte daar helemaal niets van, terwijl anderen er mee weg lopen. Maar goed, MixMeister had mooiere tutorials en ik was direct weg van de mooie grafische layout.. en zo begon ik steeds meer gebruik te maken van MixMeister t.ov. de CDJ's. Kreeg er schik in en de tutorials en youtube filmpjes gaf mij genoeg informatie om verder te experimenteren. Inmiddels heb ik het programma aangeschaft incl de Numark MixMeister Controler... ik kan niet meer zonder! Is het nu makkelijker dan CDJ... NEE! Ondanks dat MixMeister een automatische beatmix heeft, blijft het toch oefenen om ervaring op te doen, je kan ongeoefend net zo'n belabberde transitie maken als op een CDJ player. En ook zelfs geoefend is het nog uitkijken. Voor Software mixen is het net als vinyl of CDJ... oefenen, oefenen en nog eens oefenen. .....Native Audio 2 DJ MultiChannel.. deze heb je dus nodig! Koop daarbij 2 knappe (gebruikte) monitor boxen bij rond de 100 euro, en jij bent klaar. Hoofdtelefoon is iets persoonlijks, maar trek er zeker 100 euro voor uit. Dus totaal zit je rond de 1063 euro low budget klaar...of 4200,= voor de CDJ's 2000 excl. monitors & hoofdtelefoon. Nu zijn er ook goede alternatieve low budget CDJ's voor MP3... denk dan aan de 800/850 typen, maar even veel euro's als type nummers, dat is zo bij pioneer. This is best configuration you need to play live at the gigs. I did experiment with another rent Laptop. Now the Laptop is updated with the Toshiba C670-17C (Intel Core i5 next generation (quad core)) with 8 Gb Ram DDR3, 750 HDD) store price: 639 euro (Mediamarkt). The toshiba is compatible wish ASIO-2 (I tested!). The Asio drivers are included in the Native Audio 2 DJ multi extended soundcard splitter. Right in the picure, the Native Audio 2 DJ multi extended soundcard splitter. On the left (very importand to know!! ), the Sitecom 4 port USB Hub. You need that..! Why?... Laptop's are no desktop's, so you can't connect multi USB parts on the laptop. The Toshiba have only 2 USB (2.0), so that means... 2 is the maximum to handle. This USB Hub have an external adapter for power (100-240 volt). You need that for the electric power of the Numark control, the Native Audio 2 DJ, plus available external HDD (with external power adapter), better is an USB stick of 16 Gb (20 euro's), like Scandisk or Duracel are the best. Price of the SITECOM 4 port USB Hub; 18 euro. My experiences; you cannot mix without a mouse... some handlings goes faster with the mouse. Headphone I use: Sony MDR-XB500 (price around 100 euro's) have excellent full closed shell's with extra bass. Ik gebruik MixMeister Fusion nu bijna 6 jaar. Naast mijn vinyl ervaring met mixen, heb ik voor de TranceAction radioshows tot episodes 044 de Numark CDJ's gebruikt, tot dat er één kapot ging, ben ik hier ook mee overgestapt op MixMeister Fusion. Voor de andere radioshow, vrijwel direct overgestapt met MixMeister Fusion. Wat is nu het verschil tussen CDJ en Software mixing, als bv MixMeister Fusion? Een heel groot verschil, ten eerste je hoeft geen CD's te branden, met nieuwere CDJ's is dat ook niet meer nodig. Tweede grote verschil is dat je kijkt naar een enkelvoudige Waveform van de track. Een geoefend oog, herkent direct de cue-points, waar je wilt inmixen en uitmixen. Verder extra voordeel daarin, dat je de Waveform kan uitrekken, zodat je op de milimeter je transitie kan perfectioneren. Visueel zien en horen, werkt nu éénmaal beter dan alleen horen en met je vingers de maat tikken op je bureau blad. Waar je met CDJ's gebruikt maakt van een mixer om je transities te maken, de bass, treble en midrange buttons, heeft MixMeister fusion dat niet nodig. MixMeister is in feite 16x CDJ's en 1 Mixer in één, en doet niet onder voor de toch wel prijzige nieuwere Pioneer 2000 serie. Je kan via de Numark midicontroler of met de computermuis, punten invoegen (drops) en deze met elkaar te verbinden door lijnen, door deze omlaag te trekken, of omhoog. In feite doe je het zelfde als de mixer buttons, de oranje lijn is voor de bass, de paarse lijn is voor de midrange en de gele lijn is voor de trebble. De blauwe lijn is de volume, die je op 0,0 moet houden, ook in de overgangen (transities). Platen (tracks) die slecht gemasterd zijn en in volume te laag zitten, ook veel voorkomend bij oudere 192 kbps versies, kan je met de muis de blauwe lijn iets optrekken, zodat deze track gelijk loopt met de huidige generatie 320 kbps mp3 geluidsbestanden (files). Waar je met CDJ, per plaat moet uitvinden welke keyaccoord de plaat heeft, heeft MixMeister Fusion in de optiebar een mogelijkheid om deze in logische volgorde te herkennen, zo kan je de platen oplopende in Key als in Bpm op volgorde zetten door 2x klikken met de muis, wat al gauw 2 uur voor-werk is met CDJ mixen. Nog een voordeel van MixMeister Fusion t.o.v. CDJ mixing is het neutraliseren van de BPM in de transities, door deze per toevoegende plaat, onder in de bpm-balk te verwijderen, neutraliseer je de bpm's in de transities. Nadat je een set gemixed hebt, kan je achteraf de bpm's aanpassen, naar jouw smaak of keuze hoe je de set verloop wil hebben. Ik ben zelf hier zeer bedreven in geworden, je kan op de juiste plekken de bpm gelijdelijk verhogen om als ondersteuning te zijn om naar een climax te werken. Vergeet niet, dat een goede bekwame DJ, speelt met de emoties van de luisteraar. Het zijn niet de bekende platen die het doen, nee want dat is een beginnersfout, het is de volgorde van bepaalde platen, die zeer close en compatible met elkaar zijn, in geluid en ritme, opbouwend in massive en extreme elementen hebben, beinvloeding van opbouwende bpm, precies op de juiste plekken, werkt heel positie daarin mee. Nog een voordeel, waar je met CDJ's nu éénmaal (bij pre-recording radioshows) vastzit in de track volgorde, kan je met MixMeister Fusion, achteraf een track verwijderen of toevoegen. Let wel, de transities in MixMeister Fusion zijn allemaal handmatig, net als bij CDJ's. Dus vertrouw niet op de Automatische Beatmix, want dat werkt niet, alle transities moet je handmatig maken en daarmee staat MixMeister Fusion op gelijke waardering in mixkwaliteiten en vaardigheden als mixing met CDJ's met een mixer. Het grote voordeel is, dat je meer opties hebt waardoor je sneller in tijd kan mixen. Door in een radioshow, alleen met de transities bezig te houden en in feite de grote middenstukken in het bewerken overslaat inclusief de opgedane ervaringen kan ik een 2 uur radioset, mixen in 45 minuten. Dat is bruto dan, daarna begint het werk van "afmixen", het verder perfectioneren van de transities, het "cutten" (knippen en plakken) van storende stukken in tracks, of mooie stukken extra toevoegen, langer maken. In dit edit werk kan je een set verder perfectioneren en of extra effecten aan toe voegen, een waar feest voor de liefhebber daarvan. Omdat ik veel met promo's en pre-support tracks werk, die ik ontvang van platenmaatschappijen (labels) bewerk ik deze promo's altijd. Je kan voiceovers toevoegen, maar knappe rippers kunnen dat er uithalen, ook die werken met geluidsoftware. Ik voeg een copybeveiliging toe in de promo's door de van key en variable bpm te veranderen, cut stukken er uit en voeg nieuwe elementen toe, zonder dat dit direct opvallend is. Veel gehoorde vraag die ik krijg van luisteraars "waarom de platen die ik draai in de shows als bv: TranceStoned, zo anders klinken als de originele" .. kijk dat bedoel ik nu, je hoeft geen voiceovers te gebruiken, maar met MixMeister Fusion kan je creatief de platen bewerken en ze zo onaantrekkelijk te maken voor de rippers. Verder is het aan te raden om je podcast versies van je set te branden op 160 kbps, de halve kwaliteit van de originele mixtape. Tweeledig; copybescherming van de gebruikte platen, rippers hebben niks aan 160 kbps platen en ze zijn in omvang prettig te downloaden voor mp3 spelers en smartphones. Ik brand altijd 2 versies als ik de sets naar mixtape omzet, een 320 versie voor de radiostations en een 160 versie voor de podcast. Als ik mijn eerste jaar sets terugluister, die ik op MixMeister Fusion gemixed hebt, hoor ik direct de verschillen met het niveau, zoals ik nu mix. Ik vind mijn eerste jaar sets van bv. Tranced Emotion, gewoon bagger, niet omdat het slecht gemixed is, maar omdat ik nu veel vaardiger ben geworden, beter werk aflever en daardoor ook kritischer naar mijn huidige sets kijk en met gemengde gevoelens naar mijn oudere sets op terug kijk. Kwaliteit komt met de jaren en oefenen en nog eens oefenen, wordt terug verdiend in kwalitatief hoge ervaring. Net als bij CDJ mixing komt de eerste ervaring en kwaliteit pas kijken bij MixMeister Fusion, nadat je teniminste 100x 2 uur setjes heb gemixed, daarvoor mis je gewoon de kwaliteits gevoel, met name in de transities. Je mag in één set, slecht één slippertje maken in de transitie, doe je dat meerdere keren, dan rekent de luisteraar jou daar op af. Zonder de Numark midicontrol ..
Juni 2013, viel ik van een schuurdak, gleed uit ondermeer dat ik bezig was met verwerken van het verlies van mijn moeder die 3 dagen eerder gecremeerd was. Naast dat ik bijna zelf was overleden, kon mij zelf in een reflex in ademhaling reanimeren (beschermengeltje, dank je!) maar liep wel rond met meerdere gekneusde ribben, waardoor ik de Numark midicontroler niet meer kon gebruiken. Gedwongen ben ik de computermuis gaan leren gebruiken, in feite moest ik weer opnieuw leren mixen. Nu is het zo dat ik de midicontroler helemaal niet meer gebruik, het gaat nog sneller en je kan door het beeld verder uitschalen, op de miliseconde nauwkeurig na bewerken. Ik weet dat men mij soms beticht als DJ freak, en ik ga het niet ontkennen, ik ben een perfectionist in mixen, maar ook in hoe ik de set opbouw, de volgorde van platen, de extra imput van effecten, alles om de luisteraar uit zijn dak telaten gaan. Ik ben non-profit DJ, ik verdien niks aan geld met mijn shows, ben onafhankelijk en niet aan een organisatie of label gebonden, daarbij een gezond portie eigenwijs en eigenzinnig, mix ik alleen wat ik mooi vind, wat anderen daarvan vinden, zou mij echt een reet roesten ... gelukkig heb ik een groeiende fan's schare, met name uit Rusland, USA, UK en Duitsland. Het beeld wordt vaak geschetst dat DJ's rijk zijn of in luxe leven, dat is slechts voor enkelen weggelegd. Ik behoor tot de armere catagorie (afgekeurd WAO 80/100 %), moet met weinig geld rondkomen, maar creatief om met minder toch veel te doen, misschien was wel daarom de reden dat ik op MixMeister Fusion koop ben overgegaan. Ik kan dezelfde en misschien nog hoge mix kwaliteit leveren als een DJ Mag Top 10 DJ, met MixMeister Fusion zonder de peperdure Pioneers 2000 te hebben. Ik kan ze niet betalen, heel simpel. Ik ben tevreden met weinig middelen en de passie om het maximale er uit te halen! Dat beloonde zich om als 4e DJ op DI.fm Trance Channel op vrijdag een wekelijkse 2 uur show te hebben in EU prime time. Naast de 2 uur wekelijks op Trance.FM op dinsdag's in zelfde tijd heb ik de maximale top bereikt als Internet DJ. Dat koste 5 jaar omdat te bereiken met 600x 2 uur sets. Weinig vakanties (heb het geld niet ervoor, hoe graag ik het zou willen), ontzettend veel oefenen, en ... leeftijd is geen belemmering! in maart wordt ik 58, zo zie je maar, het kan! Alleen jammer dat live mixen uitblijft ... ik ben geen meeloper, ik volg mijn eigen(wijze) pad. Ik heb 35 jaar gemixed met vinyl, 5 jaar met CDJ en nu al 6 jaar met MixMeister Fusion, en wie zich blind staart op CDJ's, doe zich zelf te kort! DJ's van de toekomst komen met hun laptop naar de parties en mixen gewoon live! Dat doe ik ook, ik kan live mixen met MixMeister Fusion (300,= euro) en een hogere kwaliteit afleveren als de CDJ DJ's (4000,= euro) .... wie nu nog twijfelt is een domme ezel!